Dumplings in Turkish are called manti and it’s one of those dishes everyone craves for every time. It’s not an easy dish for many people, so people may not prefer making it at home. 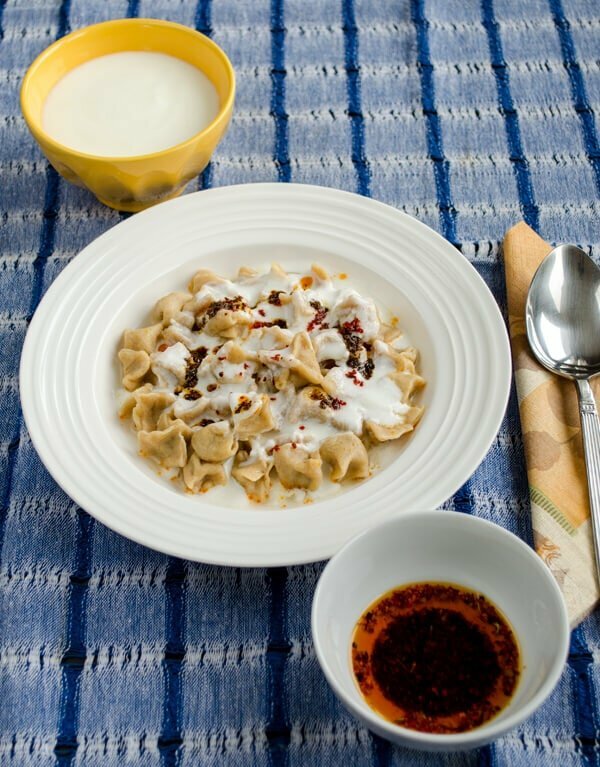 I learnt the recipe of Kirghiz Manti from a Kirghiz friend and it looks like it is easier to make as their dumpling is bigger than ours -you see how tiny ours are in the pictures, so if you feel lazy for making Turkish manti, you can try Kirghiz manti too! If you insist on eating Turkish manti, but have no time to make it, you can find it packaged at markets. I find them tasteless though, they are no different from pasta and they have almost no filling inside. There are some small bakery like shops producing and selling Turkish dumplings, which are better than market versions. If the owner of these shops is an old lady and if she herself makes it, this is even better! But still why not make it at home? Well, I admit that it’s a bit time-consuming if you are making it alone, but I can’t say that it’s a difficult dish. It might take hours to make these small dumplings depending on the amount. Time is the real concern here, so Turkish women come together at one of their homes and make it in a teamwork. At least 3 women – sometimes more work together to make dumplings especially for special days like weddings, welcome or farewell parties or family unions. One of them make dough and roll it out, another one cut it into squares, a third one put filling on each square and then they all start to close them up. 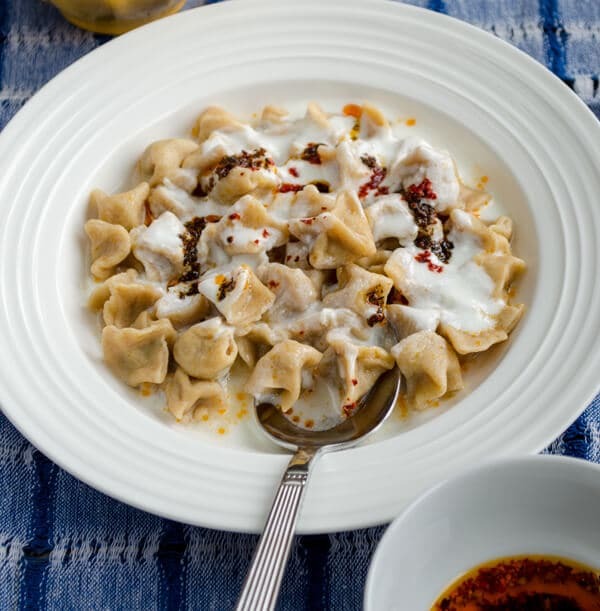 Making Turkish Dumplings Manti is more than making the dish itself. Although they serve for one purpose, which is completing the dish, women never miss the chance of having some chat; well, maybe a bit gossiping! And this is absolutely the best solution for time problem! They can hardly realize how time runs when they finally seal the last dumpling! The best part of making dumplings with some friends is that you have lots of it in the end and you can freeze some for a future cooking! It becomes an easy dish then! Just boil them in water and enjoy with yogurt! 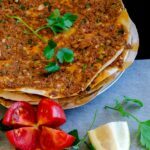 I think teamwork is definitely a must if you are planning to make Turkish Dumplings Manti for a large group of guests, but you can easily handle it yourself if you make it for two of you. You don’t need many ingredients for Turkish Dumplings Manti dough. 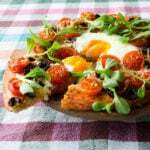 Flour, egg, salt and water are what you need. I made it with whole wheat flour, but you can use all purpose flour instead. As you are making it in small amount, one cute dough ball will be enough. I love my rolling pin! I have only one and it’s like the star of my kitchen! Roll the dough ball out not very thin, about 2mm. Cut it first into strips and then into small squares. So many dough squares waiting to be closed up! If you double the ingredients, you feel that you need someone to help you at this stage! Here starts the fun part! First fold it into two. Then you have this bundle like shape. It took me no longer than 15-20 minutes to finish them all! Don’t forget to serve it with a yogurt sauce and oil sauce on the top. I also love to sprinkle a little sumac on it. YUM! 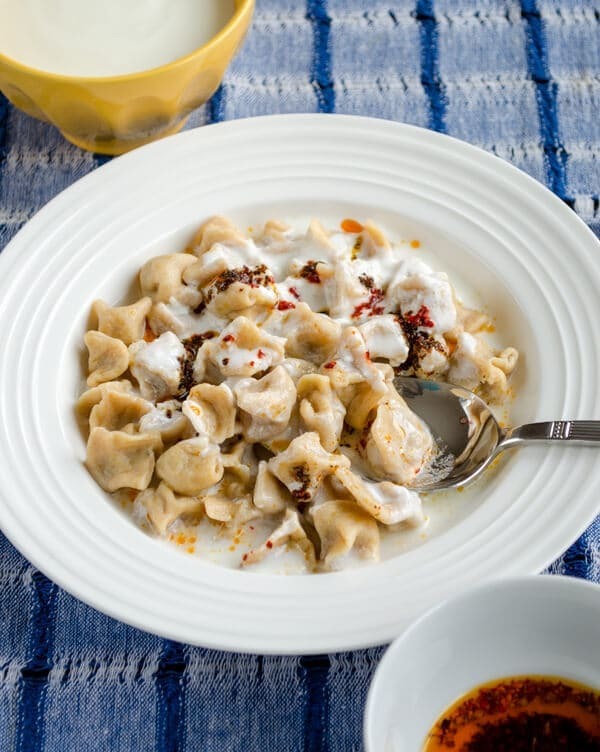 Turkish dumplings topped with garlicky yogurt and oil sauce called manti. Mix flour, egg and salt. Add water little by little and mix with your hand. Knead it well until you have a bit tough dough. You can add extra water or flour to have this result. Make a ball from it and roll it out not so thin, about 2mm thick. Cut it first into strips, then into small squares. Place a little filling on each square. Heat 4 cups of water in a pot and add dumplings when it boils. Boil them until soften for about 10 minutes. Transfer them into plates with a slotted spoon. Mix all ingredients for yogurt sauce. Heat olive oil and add dried mint and paprika, stir. Take it after about 20 seconds. Pour some yogurt on dumplings and drizzle a little oil sauce over it before serving. Hi Lisa! I’d be really happy if you make it for your mother-in-law. And it will be my honor if a Turkish woman at that age loves my recipe. Would love to hear the result when you have a chance to try it. I am so glad I found this recipe. I first had these in a Turkish restaurant somewhere in Boston a few years ago, and they were delicious. I remember the sauce had mint in it. So good. This is a favorite of almost all Turkish people. Hope you have a chance to make it soon. Would love to hear your feedback then. Well, I’ve never counted them, they are so tiny. But I can say that these are for two or three portions. Hello, quick question on this recipe. Do you cook the beef filling prior to stuffing into the dumplings? Or does it cook while they boil? Hi Alex! No, we don’t cook the filling beforehand. As they are so small in size, they can be cooked when boiling in some minutes. Zerrin, your photos are wonderful. I am learning so much from your posts. You are introducing me to so many foods that are new to me. They all look delicious! I think I will start with the pide though. I am guessing that making these dumplings takes practice. Yours are beautiful! Thank you Wendy! It’s my pleasure! 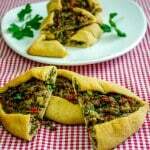 Making pide first is a good idea as it’s easier:) But I’m sure you can make these dumplings too! Did you see my Thimble Soup, which has almost the same steps? I shared a video in that post on how to make the dough squares and how to close them up in that video. It could help you! What a beautiful process and what a wonderful reward. Could these dumplings look any better? Thank you so much for sharing. I have had a long day…and I needed something delicious to cheer me up. I hope you are well. Enjoy the rest of your week. Happy Spring! Thank you Monet! These dumplings always rock! I may not have time to make these after birth, so I thought I had to share the recipe before our son comes:) Happy Nevruz and happy Spring to you too! Those are so tiny Zerrin! What patience you have to form them all. It must be a labor of love. I bet they are amazing! Reeni, these dumplings are so tasty that I don’t think of the labor they require! It’s definitely worth every single minute of work! Hi, they look good, first time hearing of this dish. I have a couple questions so I can try and make it one of this days. Can I use all-purpuse flour in case I can´t find whole wheat? Is it too much differece? And, for the filling, can I substitute the pepper paste? (I´m not sure where/if I can get it here). Hi Susan! You can definitely use all purpose flour, you may need to decrease the amount of water a little then. Dough will not be soft and sticky, so you can play with the amounts of flour and water. Also, pepper paste is not a must in this recipe, you can just leave it out. Maybe you can add a little chili powder to give it a reddish color, but it’s optional. Thanks!! 🙂 What a quick reply! I´ll try them. You’re welcome Susan! Would love to hear the result when you try! Dear Zerrin, your manti is a work of art!! : ) I know it is a labor of love, but what a result, your photos are wonderful and inspired me to have a go at them, hope soon. As you say, it would be wonderful to have friends around to make this feast, eline saglik! Thank you Ozlem! 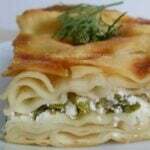 Glad to hear that my manti inspired a talented cook like you! It’s always better to make such dishes with some friends! Love your version, made all the more exotic with a Kirghiz touch! I found in Beirut a rolling pin called mantimatik made especially for making manta, it cuts them into perfect tiny squares as you roll them out; I confess though i love your rolling pin! All in perfect combination! You are right, the ones you can find in the stores are tasteless and does not have filling. I paid a hefty price to buy from the Middle Eastern store here in the US several weeks ago, Gulluoglu brand I think. It was just dough – no filling. We were so mad, we could have purchased ten boxes of pasta for what I paid for that small box. Sorry for your disappointment! Gulluoglu is so famous for its baklava, but I didn’t know that it produces manti too. So everyone (every brand) should produce what they are good at! And making manti at home is always the best as you can decide the amount of filling you place in dumplings. I sometimes bake it to freeze, but I just boil raw if I make it right away. I think it is more flavorful this way. People find it a bit difficult because they are that tiny, but I think a little work makes everything tastier! You will love these Turkish dumplings Rosa!